It only seems like yesterday that we only had the humble PDX-2000 mkI. No bells or whistles - just a plain old straight arm, 50% pitch, reverse... Ok so it had bells and whistles compared to it's rivals but that is becoming a distant memory. Not content with the one deck, Vestax brought out a digital pitch kit offering a real display plus a serious pitch bend function. So it was a year ago - a long time in this trade. At least it is these days. Vestax now have 4 versions of the PDX, each a variation on a theme. The base model - the PDX-2000 mkII was reviewed a little while ago (right here). What I have here is the deluxe superduper model - the 2300 mkII Pro - laden with all the bells and whistle Vestax has to offer. This review is a simply update on the differences between the 2 models. Essentially, there's 2 big differences - the tonearm system and pitch control. The tonearm has undergone some serious re-engineering compared to the old deck. There's even significant differences between the base deck and this top end model. Allow me to explain. Tonearm design isn't as simple as having a base, an arm with a weight at the end and a headshell and getting it to balance like a seesaw. The physics and mechanical engineering needed to keep the needle in the groove are enormous, not to mention getting quality sound from the needle and cart. There are so many variables at play - it truly is a science to get the best from a turntable. And we turntablists don't help by insisting on scratching! Vestax rocked the DJ scene when they introduced the ASTS tonearm system. A straight arm? WTF?? Displaying a stability previously unheard of, this straight arm system sent a shockwave through the DJ community. While offering tremendous stability even with poor condition needles and vinyl, many felt that having the needle at a slight angle to the groove would decrease sound quality and increase record wear. Much debate has followed on the validity of the straight arm but one over-riding fact remains - they are more stable. I found this page for a good explanation of the forces at work. So how have Vestax taken an already good system and improved it? Well I'm not going to attempt to get technical and explain the various forces effecting the needle and tonearm but the Vestax system attempts to reduce these the effect of these forces in 2 ways. 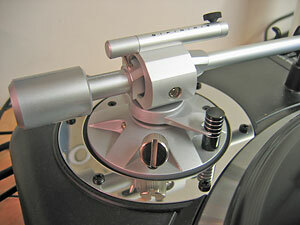 Firstly, the weight at the end of the tonearm is lower than the centre line. This provides better stability against vertical movements without needing quite as much forward weight. Next is the dynamic balance system. 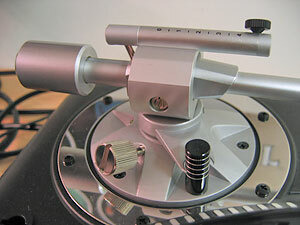 Without dismantling the mechanism, it seems to be a spring-loaded mechanism that sits on top of the tonearm base. What it does is apply a small downward tension that's distributed long the length of the tonearm - in effect keeping the needle in the groove more effectively as any up/down and left/right forces are compensated for by this overall tension rather than a point load. So to test the system's ability, I needed 3 things - a badly mashed needle, vinyl with a hole like a doughnut and finally my ultra crap heavy-handed scratch style. If anything was to make this thing skip, it's the mixture of these factors. At first, it took a little getting used to as the J-arm is considerably longer than a regular straight arm. Initially, I set the tonearm up in the regular way, using no dynamic balance tension and simply adjusting the weight. As expected, the J-arm configured this way performed fine - not really any better or worse than most other decks. So now it was time to use the dynamic balance feature and see just how it works. I put the spring on the highest setting and was immediately shocked at just how much tension was applied to the arm. Accordingly, I adjusted the balance weight to compensate. Fearing the worst I set about a scribble frenzy expecting a session of frustration and skippage. I have to say I was stunned at the performance. Even at the outer edge of the vinyl with hardly any weight applied, the J-arm stood up to almost anything I could throw at it - while giving outstanding sound quality and fairly minimal record wear. A nice side effect of this tension is that it allows for the deck to be tilted and yet still scratched with. In tests, I had the deck at 80° and it still scratched solidly. This is a testament to the quality of the system. I have to ask why you might want to scratch at such a strange angle but when you consider that QBert's QFO uses this tonearm system (albeit with a straight arm), you can see why it might be useful. So what we have is a system that holds the groove better with much less weight - a few steps closer to near perfect scratch control and vinyl longevity. Overall, this dynamic balance system is outstanding. Even though I haven't used it, I feel the straight arm version might be better for scratch DJ's. In theory, this would give marginally better stability but gives a little more platter area to play with. I guess now the more dance oriented DJ's who prefer regular tonearms will be able to scratch up techno and trance more effectively. First seen on the 2300 mkI deck and upgrade kit - if only for completeness it's worth describing how it all works. As well as the usual ±50% pitch, reverse, the 2300 has a digital display and a pitch bend joystick, but at the same time has dispensed with quartz lock. The rather annoyingly small start/stop speed adjustments are still there as well. 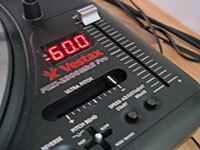 It's worth pointing out that although Vestax nominally state ±50%, you can actually make that ±60% by cranking up the ultra pitch and using the pitch slider as well. The joystick is a breeze to use. Moving it left/right gives you the 50% adjustment, up/down is smaller adjustments for those instant mix adjustments. Pressing the joystick switches between 1, 2, 3 and 6%. The response from the platter is pretty much instant - even going from - to + 50 gives an impressive seemingly instant response. And of course it all works in reverse mode as well. Something to point out about the pitch slider. It doesn't accurately correspond to the digital display. As there is no zero click on the slider, there is a 5mm zone either side of zero. But this does effect the readout. 1% on the slider isn't 1% on the display, nor is 9%. It's all a little out. In reality, this doesn't matter as you should go by the readout anyway. If you're a more musical scratch DJ and want to experiment with the new movement toward manipulating tones, notes and chords, the 2300 may well be the perfect deck for you to advance your repertoire. It's black. How cool is that? 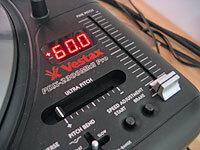 Vestax have taken an already great deck (the original PDX) and made it even better. Now stepping the spec up to the max with the tonearm and pitch improvements, Vestax have what might be the ultimate deck to please all styles of DJ's. This doesn't come cheap though - the regular PDX-2000 mkII comes in at £349/$499 - the 2300 mkII Pro adds another £100/$100 to the price tag. The regular PDX is competitive at that price but I feel the 2300 Pro is bit too pricey for the difference in performance. You have to weigh up if the additional pitch controls and better stability are worth the extra cash. In fairness to this deck, the Technics 1210mk5G is £475 and doesn't come close to the 2300 Pro. Cons: Very high price tag. Try the 2000 mkII Pro. Technics 1210 - granddaddy of them all. Now showing it's age but still hugely popular. Numark TTX-1 - Feature packed beauty. Stanton STR8-150 - Another outstanding scratch turntable.